At age 25, Bob Elson had the ideal attributes to appeal to a fledgling radio industry. With a clear voice, an engaging personality, and the innate skill to immediately convert the action before him into words, he was able to parlay a radio contest in St. Louis into a broadcasting career in Chicago covering more than 40 years. Elson graduated from DePaul Academy in Chicago, then worked for a year or two earning money for tuition before entering Loyola University, Chicago, for two semesters. He transferred to Northwestern University in nearby Evanston where he was listed as a member of the Class of 1927—but never graduated; opportunities in the field of radio had intervened. Elson took part in a radio announcing contest in Minneapolis over the summer of 1927 and was offered a job at station WCCO. He also worked for a while at station WAMD in Milwaukee. Then, in 1928, he entered another announcing contest in St. Louis, sponsored by radio station KWK. When Elson won the contest, he was offered a position by KWK, accepted and worked there briefly. But when the results of the contest were reported in the Chicago papers, local station WGN decided to pursue the home-grown talent, offering a studio announcing position. Elson returned and debuted there on March 11, 1929. He was soon doing a variety of assignments at the station: commercials, news summaries, remotes from Chicago ball rooms offering live music, lead-ins for the amazingly popular Amos ‘n’ Andy Show—everything but sports. The station already had a skilled sports announcer, Quin Ryan. Ryan was a former editor of the Chicago Tribune, WGN’s owner, but, despite his success as an announcer, Ryan was more interested in the station’s management than in being behind a mike. So the same year he joined WGN, Elson was invited to assist Ryan in the announcing booth for both Chicago Cubs and Chicago White Sox home games. By 1931, these assignments were entirely Elson’s, at least at WGN, where Elson would continue to handle both teams’ home games through 1942. Having received major-league baseball’s most prized assignments, Elson soon became the announcer of choice for other sports. In the mid-1930s he got into professional football and hockey, calling Chicago Cardinals and Chicago Blackhawks games, spots he held into the mid-1950s. He also reported major boxing matches, horse races, and college football games. At times, he shared the announcing chores with the other great radio talents of the day: Ted Husing, Lowell Thomas. Gabriel Heatter, and Red Barber. On the airwaves, his voice was ubiquitous, and he was popular on the banquet circuit. Sporting News issues from the 1930s through the 1960s are peppered with announcements of Elson as emcee or main speaker at various sports galas. But Elson didn’t stop at being the top sports announcer of the day; he also became the premiere interviewer of the era. Elson soon realized he had interviewing skills that could be expanded. The New York Central Railroad’s premier passenger train, the Twentieth Century Limited, steamed out of New York City every evening, carrying the rich and famous to Chicago’s Union Station, then back. Elson approached the railroad’s management about a passenger interview show; when the railroad realized that their famous train would receive a free plug on the radio, they complied. On March 4, 1946, Elson began his 15-minute interview program on WGN, Bob Elson on Board the Century sponsored by Krank’s Shave Cream. Elson interviewed actors, writers, business leaders, politicians—whomever was making news. The show was broadcast in New York and Hollywood; the stars wanted to be on Elson’s program because it upped their prestige. Commissioner Landis had no objection to Elson’s interviewing sideline, as long as he didn’t mix screen stars up with baseball. Landis warned Elson before one World Series assignment: “Stick to baseball. There’s going to be a lot of Hollywood people in the park, and I don’t want to hear a thing about them. I don’t care if Harpo Marx slides into second base…it better not be mentioned in the broadcast.”7 By the early ‘50s though, railroad travel was diminishing, and Elson’s interviewees were more inclined to fly. He himself was not comfortable with air travel at the time,8 so he switched venues, taking his interview show to the famous Pump Room in Chicago’s Ambassador East Hotel. The program, broadcast on weekday afternoons from one to three, was done whenever Elson was not committed to sporting events. Elson encountered a number of changes to his life in 1942. He was attending a fashion show luncheon at the Marshall Field department store’s Tea Room with friends in 1941 when he was attracted to one of the models, Jeanne Kuhl, 14 years younger than Bob. They were introduced by friends, a romance bloomed and led to marriage on February 28, 1942. The couple had three children: Barbara (born in 1944), Susan (1946), and Robert Jr. (1957). Elson and his family made their home on Chicago’s North Lake Shore Drive until his death. With the US in World War II since late 1941, Elson felt a commitment to join the armed forces, and on September 14,1942, he was inducted into the Navy as a lieutenant, senior grade, at the Glenview (Illinois) Naval Station. The Navy didn’t need Elson to fly a plane. He was sought for his many connections with show business personalities and his skill in finding quality entertainment for U.S. bases throughout the world. Elson served in this capacity through the end of the war and beyond. Even after his Navy discharge in October 1945, he continued to arrange for groups of entertainers to tour hospitals and service bases. With the exception of one Series, Elson lost his place as a World Series and All-Star Game announcer while he served. After years of shunning radio, the New York clubs—the Yankees, Giants, and Dodgers—were all broadcasting their games in 1938, and naturally expected their announcers to be assigned to these classics. Elson, however, had been called on to do the 1943 Yankees-Cardinals Series by President Franklin D. Roosevelt, and is still the only announcer to call the Series in uniform. In 1947, Elson, now known as “The Commander” due to his service in the Navy, was ready to return to the airwaves. Brickhouse had been able to build a career in Elson’s absence, but in post-war euphoria, most major league teams, including the Sox and Cubs, were planning to broadcast all games, both home and away. As a result, broadcasting positions in Chicago were doubled. Elson had his pick of jobs, and chose White Sox radio. The selection was fortuitous, as the Sox embarked on a streak of 17 consecutive winning seasons between 1951 and 1967, while the Cubs remained in the doldrums for 19 years through 1966. But Brickhouse also made a heady career move, becoming WGN television announcer for both the Sox and Cubs. 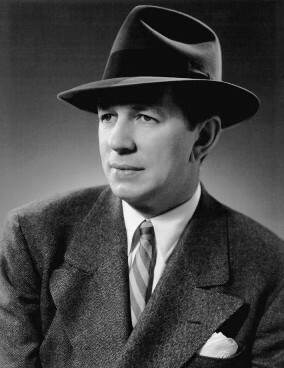 Elson’s postwar White Sox tenure began at Chicago radio station WJJD. He then moved to WCFL (“1000 on your dial”), and finally in the mid-1960s to WMAQ. His Sox broadcasts had a variety of sponsors, including White Owl Cigars, General Finance Company, and Sinclair Oil. Elson gave loyal plugs for his favorite restaurants, tailors, haberdasheries and the like as he described the game, passing on an unsolicited good word for businesses that treated him well. Elson continued broadcasting the Sox (who futilely pursued the New York Yankees and Cleveland Indians through much of the ‘50s), and the lackluster football Cardinals (who left Chicago for St. Louis in 1960). And after years of doing games for the subpar Blackhawks, he cut back his workload just in time to miss their ascendency to the Stanley Cup with Bobby Hull and Stan Mikita. The Sox had hired manager Al Lopez away from the Indians in 1957, giving the franchise renewed hope for a championship, and bringing Elson a gin rummy opponent with reputedly enough skill to challenge The Commander. Elson had long tooted his horn about being the world’s greatest gin rummy player. He had a photographic memory which logged all discards, and no one in the Sox organization was willing to play him—until Lopez showed up. (The results between the two men remain unreported). Elson had performed quite adequately in the booth without assistance throughout much of his career. Of the 7,000 baseball games he did over a 40-year career, he missed only about half a dozen due to laryngitis or illness. But in 1954, when he was in top form at age 50, the Sox gave him a back-up. Don Wells had gone to announcing school on the G.I. Bill, and with minimal minor league experience, would now complement Elson, calling two innings a game with some between-innings announcements. Wells remained with Elson through 1959, before getting a higher-profile position with Gene Autry’s Golden West Broadcasting Company and the expansion Los Angeles Angels. Wells was replaced by Ralph Kiner, a future Hall of Fame slugger who happened to be a close friend of White Sox vice president Hank Greenberg. Kiner and Greenberg had been buddies on the Pittsburgh Pirates at the end of Greenberg’s career, and Kiner now wanted to get into broadcasting. Kiner was in Chicago for two years before moving on to the terrible (albeit Amazin’) expansion New York Mets. Milo Hamilton then moved in beside Elson, but he left to take up another mike when the Braves re-located from Milwaukee to Atlanta in 1966. In 1967, Elson was joined in the booth by Red Rush. Rush had built a following in Chicago in the early ‘60s broadcasting Loyola University basketball games. Loyola’s Ramblers were then the highest scoring team in the nation, featuring a pressing defense to go with constant fast-break basketball. The Ramblers were exciting and so was their announcer; Rush brought a flamboyance to the mike which matched the exuberance on the court. Rush arrived in the Sox booth just in time to assist Elson in describing one of the most exciting pennant races in American League history. Four teams—the Sox, Minnesota Twins, Boston Red Sox, and Detroit Tigers—fought until the last week of the ’67 season. Chicago was doing it all with a tremendous pitching staff but very little offense and finally succumbed to Carl Yastrzemski and the Red Sox. Elson’s cool delivery combined with Rush’s color to match the Sox’ fight-to-the-end field mentality. The White Sox pitching, though stellar again in 1968, couldn’t offset the team’s chronic weak hitting. Their record plunged, dropping them in eighth place in the 10-team AL. The next year was no better, and in 1970 the Sox hit their nadir, a 106-loss season. The Sox had become a dull, uninteresting club, and it showed at the turnstiles as 1970 attendance plummeted below 500,000. The White Sox ownership during this period, the Allyn brothers, Art and then John, were businessmen who wanted to be sportsmen but not losers. After the terrible 1970 season, John Allyn frantically searched for a fix, including proposing a move to Milwaukee. Allyn dumped long-time Sox employee and general manager Ed Short, then hired Stu Holcomb to operate the club. Holcomb, a former football coach and athletic director at Northwestern University, found two rising stars in the California Angels organization. He hired Roland Hemond to be the new Sox GM, and Chuck Tanner to be the field manager. Elson then gracefully moved into what was for him a form of retirement. He did color as part of the Blackhawks radio team for three years. He was asked by a Chicago bank, Northwest Federal Savings and Loan, to do a live interview show from the bank’s lobby on Saturday mornings. Once again, he was doing a work he relished, talking sports with personalities from the Chicago athletic scene, encouraging his guests to reveal a little bit more than they might have intended, yet not enough to cause embarrassment. On August 5, 1979, Bob Elson was a recipient of the Ford C. Frick Award, the third announcer, after Mel Allen and Red Barber, to be so honored. With his children in attendance, Elson was introduced to the audience by Blake Cullen, a close friend and the Cubs’ former traveling secretary. Elson told an anecdote or two, referred to his friendship with Commissioner Landis, and concluded by saying that his only regret was that he had not broadcast more championships for the great fans of Chicago. Bob Elson passed away from a heart condition on March 10, 1981, at Augustana Hospital in his beloved city, Chicago. He was 76 and had been preceded in death by his wife, Jean, who died of lung cancer in 1975. Bob Elson is said to have begun a memoir during the last year of his life. His belief was that “a man shouldn’t write his life story until he has given up his active career.” 16 Had he lived to complete it, his legions of Chicago fans would have loved reading it. An updated version of this biography appears in SABR's "Go-Go To Glory: The 1959 Chicago White Sox", edited by Don Zminda. In May of 1951, when I was eight years old, the Chicago White Sox had a 14-game winning streak and caught my dad’s attention. He started listening to Bob Elson’s broadcasts over WCFL radio. Since we didn’t have a television and but one radio, Bob Elson’s voice became a constant presence in our household and to me as a boy. Elson was a faithful instructor who would mentor me on baseball history, on standings and stats, on strategies and on the Sox’ lamentable habit of leaving men on base. There weren’t too many “White Owl Wallops” (“and a box of White Owl cigars”) for the Sox in those days, and I was too young to hit up “Friendly Bob Adams” at General Finance for a loan. But Bob Elson gave me a passion for baseball, especially good pitching, that I have maintained all my life, and passed on to my son. This one’s for you, Bob. Related link: Read "Bob Elson and WGN-Chicago" by Fred Taylor, from SABR's Winning on the North Side: The 1929 Chicago Cubs (2015). Barber, Red. The Broadcasters (New York: Dial Press, 1970). Ham, Eldon L. Broadcasting Baseball (Jefferson, North Carolina: McFarland and Co., 2011). Lindberg, Richard C. Total White Sox (Chicago: Triumph Books, 2006). Vincent, Fay. The Only Game in Town (New York: Simon and Schuster, 2006). Wiles, Tim. “Jack Brickhouse,” SABR Biography Project, sabr.org. Archives, Loyola (Chicago) University and Northwestern University. Elson family scrapbook, courtesy Susan Minifie, Bob Elson’s younger daughter. Ed Stone, author’s telephone interview, September 23, 2014. Susan Minifie, author’s telephone conversations and email correspondence, 2009. 1 The Crisis Magazine, December 1913, 58. 2 Bob Vanderberg, SOX: From Lane and Fain to Zisk and Fisk (Chicago: Chicago Review Press, 1982), 348. 3 Eddie Gold, “Elson Named to Hall of Fame,” Chicago Sun-Times, February 16, 1979. 4 Jack Craig, “Elson Is Dean of Baseball Announcers,” The Sporting News, June 13, 1970. 6 Larry Lester, Black Baseball’s National Showcase: The East-West All-Star Games 1933-1945 (Lincoln: University of Nebraska Press, 2002), 107. 9 John Dunning, On the Air; the Encyclopedia of Old-Time Radio (New York: Oxford University Press, 1998), 104. 10 Elson’s show, Sports and Comments, sponsored by automobile dealer Manhattan Motors, gave game scores and a brief interview. Elson received a 1954 TV Guide trophy as Best Sportscaster to go along with his two awards as Best Baseball Announcer from The Sporting News. WBBM Personalities, March 1957 (Minifie; Elson family scrapbook). 11 Jack Brickhouse, Thanks for Listening (South Bend, Indiana: Diamond Communications, 1986), 21. 12 When it comes to practical jokes, what goes around comes around. One evening, Elson was doing his regular sports re-cap show when a group of his friends walked into the studio, accompanied by a beautiful young stripper. Standing in front of Elson, with his audience unaware, the young lady proceeded to do her act—taking off absolutely everything “but her toe nail polish” as Elson did his show. Elson managed to get through the show, sweating bullets and later remarking “Boy, would I like to have a tape of that show. I don’t know to this day what I said.” Brickhouse, 30. 13 Curt Smith, Voices of the Game (South Bend, Indiana: Diamond Communications, 1987), 180. 16 David Condon, “Bob Elson, 76, longtime Cubs, Sox ‘voice’ dies,” Chicago Tribune, March 11, 1981.